What do you do when your town is overrun with soccer-playing, river-dancing mice? Charlie Brown has an idea -- call Snoopy to the rescue! In this delightful Peanuts Classic -- the last special developed under the supervision of creator Charles Schulz -- Snoopy becomes the Pied Piper Beagle. Playing a magical-sounding concertina, Snoopy travels from street to street trying to make the troublemaking mice follow him out of town. Will it work? We'll find out as this beloved story unfolds and have a lot of fun dancing, laughing and playing along the way. Featuring a bonus tribute to Charles Schulz, It's The Pied Piper, Charlie Brown is a program every Peanuts fan will cherish. DVD: Standard 1.33:1; audio English Dolby Surround; subtitles English; closed-captioned; single sided - single layered; 5 chapters; rated NR; 24 min. ; $19.99; street date 9/12/00. Supplements: Exclusive Charles Schulz Retrospective Interview. Some entrances from public life are better than others, and at least in the case of Charles Schulz, they can be downright poetic. After almost 50 years of writing and drawing "Peanuts" - for my money the greatest comic strip of all time - illness finally forced him to step down and cease production of the strip at the end of 1999. Much to Schulz' credit, he had long-ago decided that no one else would take over the series for him; when he quit, that was it for the classic strip. Schulz' final daily offering appeared on January 3 2000, while the last Sunday strip came out on February 13 2000. Schulz passed away the evening prior to that Sunday, which made an already-melancholy moment all the more sad. A less-celebrated end accompanied the demise of the strip. Although he wasn't going to create any more panel cartoons, I believe Schulz intended to continue work on "Peanuts" animated specials even after his retirement, but obviously his death stopped any of those plans. As such, that means 2000's It's the Pied Piper, Charlie Brown spells what appears to be the last new piece of "Peanuts" material we'll ever see. I wish I could state that the series went out on top, but the weak quality of ITPPCB forces me to state otherwise. None of the animated specials were ever as good as the best examples of the strip, but they could be quite strong, starting with the first, 1965's A Charlie Brown Christmas. While it isn't a totally terrible offering, ITPPCB seems pretty bland and unmemorable nonetheless and does nothing to further the series' legacy. The program retells the classic legend of the Pied Piper with Snoopy cast in the title role. Since it's such a basic story - mice overrun town, Pied Piper leads them away and then gets revenge when the town reneges on promised payment - there's not a lot of room for embellishment, though they try to liven in up in cute ways. Rather than run-of-the-mill rodents, the burg is inundated with "sports mice" who play soccer, dance and do other wacky things. That component adds a little charm to the show, but it also feels like padding to a degree. As I stated, it's a very brief tale with little room for exposition, so we find an excessive amount of mouse footage. It's fun for a while but it does get old fairly quickly. One major miscue in the program also affected 1988's The Mayflower Voyagers: adults. Schulz always omitted clear views of grown-ups in the strip and most of the animated programs because he wanted to focus on the kids' point of view exclusively. This led to the legendary "whaa-whaa" sound made by speaking adults, as their influence was felt but never clearly articulated in most of these shows. I didn't like the exposure received by adults in TMV, but at least it seemed fairly sensible, as it would be difficult to depict the trek of the Pilgrims without much coverage of grown-ups. The same probably goes for ITPPCB, but I certainly wish they'd tried a little harder. There's simply something unappealing about the presence of adults in "Peanuts" features. They take away from the desired effect and make "Peanuts" less distinct and special. In any case, even if ITPPCB didn't clearly feature adults, it still would have been a dud. The program simply lacks any inspiration or spark. Frankly, I can't find anything especially bad about the show, but it largely falls flat and seems quite bland. The humor is weak, and the characters show little of their usual verve. "Peanuts" was a special comic strip, and it contributed mightily to the advancement of the genre. The strip inspired some fine animated specials, but unfortunately the final one, 2000's It's the Pied Piper, Charlie Brown, doesn't fall into the "good" category. It's a lackluster piece that has little to do with the "Peanuts" universe; it might as well have been any form of generic characters for all the fun Charlie Brown and his friends inspire. 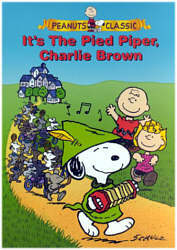 It's the Pied Piper, Charlie Brown appears in an aspect ratio of approximately 1.33:1 on this single-sided, single-layered DVD; due to those dimensions, the image has not been enhanced for 16X9 televisions. The picture doesn't look great simply because the animation is pretty cheap work, but the transfer seems solid overall. Sharpness had been a concern with many of the other "Peanuts" DVDs, but it's not an issue here, as the image seems crisp and well-defined throughout the show. Moir� effects and jagged edges add no problems. Print flaws - another typical problem with other "Peanuts" programs - create no concerns here either. I detected no signs of grit, grain, scratches, blotches, hairs or other defects, as the image appears nicely clean. Colors are clear and bright, with hues that remain fairly basic for the most part but that usually seem accurate and quite nice. Black levels are deep and dark, and shadow detail seems clear and appropriately-opaque. I didn't give ITPPCB a higher grade simply because the fairly-poor animation means that the show simply doesn't look that great, and I think "A"-level ratings should go only to discs that present excellent images. However, the DVD seems to transfer the original material very accurately. The Dolby Surround soundtrack of ITPPCB also seems limited but good. The soundfield mainly sticks to the center channel with the exception of David Benoit's music, which spreads nicely to the side speakers. I detected one or two effects from the side channels as well, but for the most part, dialogue and effects emanate solely from the center. The surrounds contribute some light reinforcement of the music but don't add much to the experience. Audio quality seems very good. Speech was clear and distinct, with no edginess or problems related to intelligibility. Effects were crisp and clearly delineated, and the music sounded bright and rich, with some decent bass as well. ITPPCB remains a fairly modest affair but it complements the program well. ITPPCB tosses in one supplement, a "Retrospective Interview with Charles Schulz". Called "An Enduring Classic", this program lasts for 11 minutes and 25 seconds and provides some basic information about the "Peanuts" strip. Schulz discusses its origins and traces through the first appearances of some major characters. He also talks about how the TV specials came to exist. Frankly, Schulz seemed to be a rather dull interview subject, and while I enjoyed some of the information he presented, the piece itself comes across as a bit boring. Nonetheless, it was nice to get this minor look at his career, especially since it featured the man himself. I hoped to enjoy It's the Pied Piper, Charlie Brown, since I'd like to see Charles Schulz' career end on a high note. Unfortunately, the program is dull and ordinary, with little to recommend it. The DVD offers quite solid picture and sound plus one minor extra. Between the bland program and the relatively high price - $20 for about 37 minutes of material seems awfully steep - this is one DVD that you should probably leave on the shelves.